A few days ago the scholars Mélodie Garnier and Norbert Schmitt published a list of most common phrasal verbs in English. Moreover, they listed the most frequent meanings of the verbs. The pedagogical impact of this discovery is really big. Finally we have the list of the phrasal verbs we should teach. You can see the abstract of the article here. Having the list at my disposal I could not resist and I created the following post. There is an infographic with 8 most common phrasal verbs, two games and a worksheet with 4 exercises. According to the research the most common phrasal verbs in English are come up, go out, come back go on, find out, come out, go back and pick up. 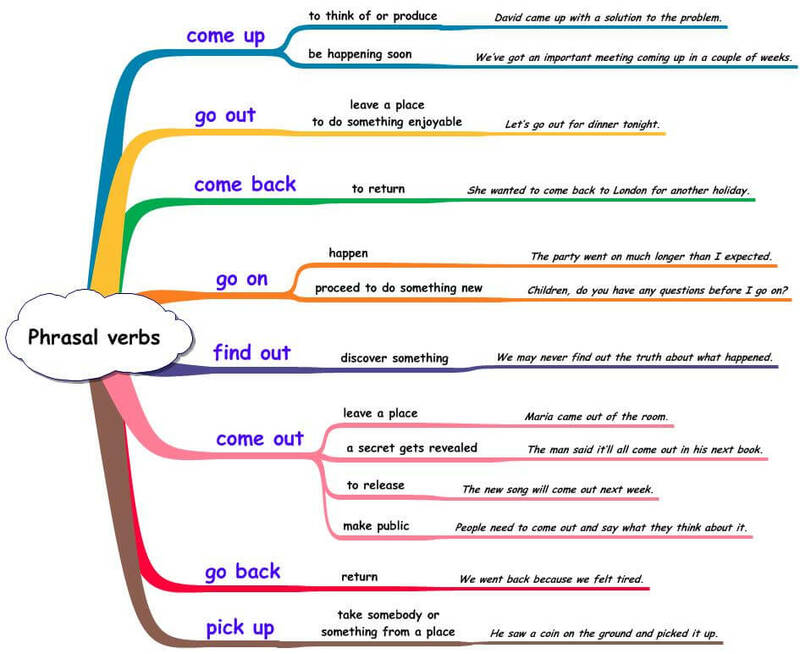 I have displayed the verbs in the following mind map. There are the phrasal verbs, their meanings and example sentences. The second game is called Fling the Teacher. To win the game, you have to answer all the questions by choosing the correct phrasal verb. If you answer all the questions correctly you will fling your teacher. (But I am sure, that he/she will not mind as long as you know all the phrasal verbs 🙂 ). The game is in Flash and it will only play on desktop computers. You can download a worksheet with all the phrasal verbs here. In the worksheet you can find a text which contains all the phrasal verbs. I think the teenagers will love the story 🙂 Then there are comprehension questions. In task two, students should use the phrasal verbs and complete the questions. Check their answers. Now ask them to choose three questions they would like to ask you. Answer the questions as well as you can. Then the students work in pairs and discuss the questions in pairs. In exercise three students complete the crossword. In exercise fours students can complete the text either in writing or orally.